The Grand Canyon is a colorful, steep-sided gorge, carved by the Colorado River, in northern Arizona. 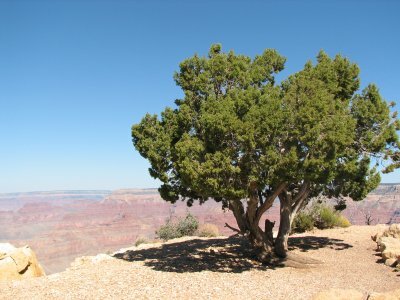 The canyon is largely contained in the Grand Canyon National Park - one of the first national parks in the United States. The canyon, created by the Colorado River cutting a channel over millions of years, is about 277 miles (446 km) long, ranges in width from 4 to 18 miles (6 to 29 kilometers) and attains a depth of more than a mile (1,600 m). Nearly 2000 thousand years of the Earth's history has been exposed as the Colorado River and its tributaries cut through layer after layer of sediment as the Colorado Plateaus have uplifted. The Grand Canyon was one of the first WHS on the List (1979), and was inscribed matching all 4 natural criteria. I tried to be there early, leaving my hotel in Flagstaff at 7 am. After two involuntarily rounds around town trying to find the right exit (I already had got lost the night before on the way back from the supermarket to the hotel), I headed north to Grand Canyon (South Rim). The sun already was shining brightly. The highways 180 and 64 are quiet roads within pretty surroundings. Arriving at the gate of the park after 1.5 hours, I had to pay an entrance fee (per car) of 25 dollars - the highest amount I've paid in the US to get into a park or other attraction. I parked my car in Grand Canyon Village, and from there I had my first look at this enormous crack in the earth. From the village I started the Rim Walk westward, to Hermit's Rest. The Rim Walk is quite flat: I heard a German tourist say 'Grandmother could have come with us'. The height and the dry air does wear you out though, walking here is much harder than on sea level. The trail follows the edges of the canyon, so you can have a look down at the wonderfully carved rocks all the time. The easy walking is a very pleasant way to experience the park, smell and see its nature. Hermit's Rest at the end of the trail is a small souvenir and snack stall (with a great old fire place). From there, the free shuttle bus took me back to the village. Exiting the park I took the Desert View Drive. This has some more viewpoints (from a different angle) on the Canyon. A lot of them were crowded with people and their cars though. Even on a Monday in late September the Grand Canyon attracts many, many visitors from all over the world (over 4 million yearly). In retrospection, I had a good time but I think it's more convenient to stay overnight inside the park. That way you can beat both the sun and the crowds, and have a more in-depth experience of the site. I visited the Grand Canyon in August 2016. I stayed 2 nights in Tusoyan town (just 5 minutes from the park). I did two day trips. 1) like Els above, walked to Hermit and drove along the other view points. 2) the South Kaibab Trail hike up to Skeleton Point. This is a hike you really should do. it's betweeen 4-6 hours pending how fast you go. I walked with my daughter of 11 and she could easily do it. Don't take your grandma there! Make sure to take water. A LOT. At least 5 liter per person I think. check my site for Panorama photos. some made of 80 separate photos making them 150 MP resolution (the original; the one on the site are downsized.) If you are interested in the 150 MP resolution files ask me! I've waited to review the Grand Canyon until I visited the more remote North Rim. I have now visited Grand Canyon National Park (4) times, and the last visit (North Rim) turned out to be the most rewarding. Firstly, I camped at the North Rim campground for $18. 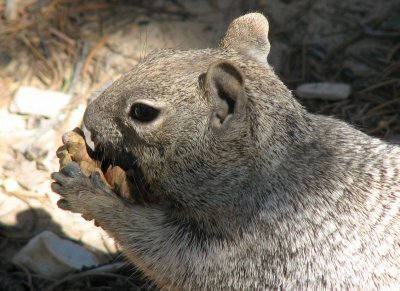 This campground is a prime habitat for the endemic Kaibab Squirrel, which is only found on the Kaibab Plateau. The campground is also located near the iconic structure "Grand Canyon Lodge" built in 1937, which offers fine dining and a stunning view. From here there are several trails both on the plateau, on the rim, and into the canyon. All worth the time if you got it. Secondly, and one of the most rewarding drives in the North Rim is the Cape Royal road that ends with the sublime Angel's window, and several more hikes (easy, moderate, difficult). I particularly enjoyed the Cliff Springs trail, which is not very long, but is quite stunning, and not a typical scene in the park. One of the benefits of the North Rim was the very different atmosphere. The north unit is not visited by millions like the South Rim. It is not - viewpoint to viewpoint stopping. Indeed, you will have whole trails and views to yourself, even on a holiday weekend. I also benefited from camping in the park, morning and sunset views, a starry night sky, contemplation and discussion at the campfire is something difficult to beat. At about 1,000 feet higher than the South Rim, the views are even more stunning and the visitor numbers are far more moderate. I loved my time in the North Rim, and while I still appreciate the views and historic structures on the South Rim, if I return I'm headed north. My favorite part of visiting the Grand Canyon isn't the canyon at all. While it's one awe inspiring view after another, I found myself most impressed with the local Native Americans musicians and dancers. It was like being transported back in time. The whole experience is entrancing. If you have an opportunity to go, you must!! trip to California, I have to say that it was a highlight. anyone who is in the area, a must see. 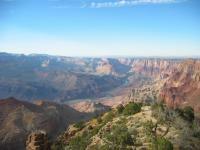 We went to the North Rim of the Grand Canyon after a tour of the Utah national parks. What a surprise! After having been to the South Rim, we were expecting the same... not at all. It's about 1000 feet higher than the southern portion and we were met (in August) with a brief snowfall. We were also surprised by how heavily it was forested and spent quite a bit of time watching the chipmunks. We made the mistake of not staying at the Lodge .... a lot of reasons: one day really isn't enough, with all the hiking that you do it's not a good idea to travel afterwards, and most of all, you're so reluctant to leave, it would be a blessing to have planned in advance to delay the departure! I was Overwhelmed by this canyon. corny as it sounds, there just aren't words to describe its enormousness and beauty. I went in winter, and it was freezing cold; there was snow covering the entire canyon (though I hear it was 10 degrees Celsius warmer at the bottom of the canyon). Though the canyon has been developed, it is so majestic, it seems that nothing can ruin the experience. This is definitely one of the seven wonders of the world, and visit to this site is amazing. Yes, the Grand Canyon is all that it's cracked up to be! I've been twice - once when I was 9 and as an adult. During the former trip, we drove in my cousins car from LA and saw other tourist sites along the way, including the Hoover Dam and Vegas. I remember it being stinking hot at 110 degrees Fahrenheit and the drive was almost unbearable, even with the AC. My younger sister screamed and cried for a good part of the trip because she was so uncomfortable. But once we arrived, I kind of forgot about the heat and was astounded by the rock formations and fantasic colors. I went again in 2004 with my then-fiance' while we were in Vegas. We took a plane ride above it and I can say that the ride was worth it. You really get a sense of how massive the canyon is. For those of you considering a visit, the Grand Canyon will not disappoint! into the great chasm, your problems seem insignificant. 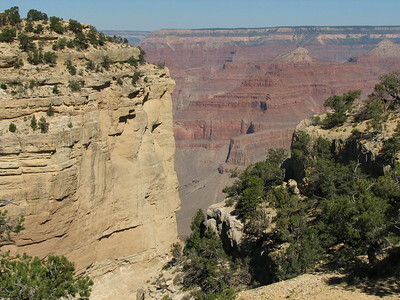 the canyon from the north rim in October 1994. As said below this is Awesome in the proper sense of the word. I was lucky enough to be able to fly to the canyon from Las Vegas. The flight starts out across the Mojave desert before travelling over the Hoover dam and Lake Mead, which is all pretty impressive then the canyon proper starts. It is on a massive scale which I was not expecting, I was pretty much expecting two banks opposite each other like you see on post cards, not the vast expanse of canyons stretching off as far as you can see. Overall it was just the sheer size of the site that was spectacular in both its e breadth and also how deep it actually is, I guess the name should have given me a hint! I would love to be able to go back and spend a few days travelling around, hiking down to the canyon floor and seeing the Colorado River up close, there is easily enough to keep you entertained for at least week from the look of things, and I feel even as a dedicated Urbanite that this would be something that would really appeal to me in the future. Natural sites don't normally feature highly on my hit lists, however if you get to go to South Western USA this is well worth heading several days out of the way for. We headed out there from LA (a city I have grown to like over repeat visits) and spent a long weekend in Las Vegas, which is worth going to see for the absolute monumental waste of money that happens there, still an impressive if highly unique destination. The Grand Canyon overall is awesome, and I can see why a few years ago it topped a BBC list of greatest places on Earth to visit. My first impression of the Grand Canyon was a mental struggle to grasp the enormity of it all. Sure, it's essentially a really big hole in the ground, but what a hole! Add to that the real Western flavor and pleasing native flora and fauna, and what you wind up with is an incredible life experience, and most likely, a passing feeling of insignificance compared to the splendor of the natural world. The south rim of the Grand Canyon is reasonably user friendly to people travelling by public transport. There are buses from Flagstaff station to the Park that connect with the trains passing through. And a bonus, if you travel to the Park by bus entry is free. Then there are the shuttle buses within the park that take you to the sights, also for free. Well i was only 17 when my Australian family of a mum, dad and 13 year old brother josh visited America for 6 months. After 1 and 1/2 months it was my 17th birthday. I could go anywhere i wanted my father told me. What caught my eye after days of thinking was that some world famous people visited the much loved site. No one beleived me when i told them the Grand Canyon. "You wont like it." My parents explained to me. I would just have to figure it out myself i thought. Now i'm 25 and have a beautiful 5 year old boy of my own. We are visiting the Grand Canyon next year. I would encourage everyone to go. IT'S SIMPLY AMASING!! The Grand Canyon is one of those few things in the world that lives up to its hype. It's a breathtaking, astonishing site, and the National Park Service has done a good job of keeping the area clean and natural (no mini-golf or Wal-Marts! ), with signature WPA-era stone and timber architecture for the park service center. I've been there three times and would go back again in a heartbeat. Recommended: stay in Flagstaff, and stop in on Wupatki National Monument and the Painted Desert areas on your way up to the Canyon. This whole area is peaceful and astonishingly beautiful. One unexpected thing that stays with me is the sound of the wind in the pines that flank the canyon. You'll probably also see chipmunks if you sit still. The Grand Canyon is just GRAND! I love this part of SW US; if you look at the whole area, starting with Bryce and it's hoodoos (eroded sandstone formations), then go south to Zion Natl. Park (eroded granite) and continue south to the north rim of the Grand Canyon (eroded everything), you can get the whole picture of what has happened by water and wind to this entire area. Throw in Monument Valley, the Painted Desert (multi-colored), the Vermillion Hills (purple)and on south to Sedona for a spiritual finish. This was a great 10 day trip, with a bush w/ hundreds of hummingbirds and beautiful hikes. Stay in Springdale,UT and the Northridge Lodge, if you get the chance. Simply stunning. One should not have to leave this earth without having seen Grand Canyon. It makes you just stare in amazement and wonder. On a more practical note, I went there by train - an original Western railroad from the town of Williams, complete with a bandit holdup. Clichéd maybe, but still fun. The train's schedule gives you just a few hours at the canyon, so maybe you should stay there for the night. Anyway, it will be an unforgettable experience. That about sums it up, and what's more is that I don't think there's a picture in existence that can do it justice (although I've included a pretty one from the South-Eastern end). 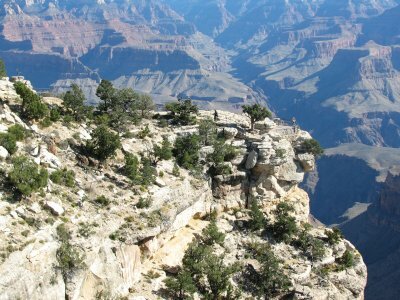 My husband has been eager to take me to the Grand Canyon for as long as I've known him, and we made the trip in September 2004, on our tour of some exceptional World Heritage Sites in the South-Western USA. It was the first WHS of the trip and though I spent three days rambling around, hiking and viewing the Canyon from many angles, I never got used to seeing it. It's so huge that it doesn't look real - it seems like a painting. Unfortunately, it's a major tourist attraction and can get quite crowded. The first day we ventured up there (we were staying in nearby Williams, Arizona) was the Sunday of a holiday weekend, and the throngs of people were most intimidating. The worst thing of all was that people were climbing over the safety barriers out onto rock ledges for photo opportunities. Most tourists don't realize that people fall to their deaths into the Canyon every year, and all it takes is for someone to lose their footing on one of those rocks! What we found, though, is that most people stopped at the main viewpoint by the visitors' centre and never bothered to go anywhere else. 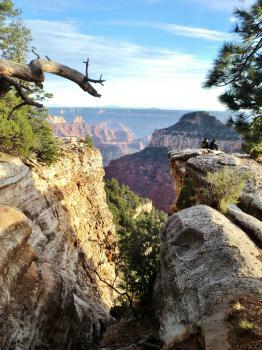 On that first day we caught a shuttle bus (just park the car and leave it) out to the Kaibab trail (the trail with the best views, in our opinion) and hiked below the rim. Even on that busy holiday we saw relatively few people on the trail, which was nice. Even the easy trails are quite challenging (what goes down must come up), but if you come prepared with your water and salty snacks, it is completely worthwhile. We also recommend the Desert View Drive, which takes you to the East end of the Canyon, and also seemed relatively unpopulated by tourists. We had our best views on that drive. Everybody talks about viewing the Canyon at sunset; however the whole experience is overrated, in my opinion. We took another shuttle to Hopi Point on our last night (when most of the holiday weekend crowds had left) and it was crowded (so most people didn't get many nice pictures) and not that nice anyway. My father warned me that there would be planes flying into the Canyon all the time by rich jerks who'd rather pollute the air and disturb all the other visitors than get some exercise and walk to see the great views, but happily this was not the case when we were there. I don't think I saw a single plane. "It is just a big crack!!" i was willing to be soo unimpressed by the Grand Canyon but it is impossible to be. the whole place is just fantastic. I have never been to a natural site as awe-inspiring as this! I just flew in on a day trip from Las Vegas, the flight along the Colardao and over the Hoover dam and Lake mead was impressive but as soon as you hit the canyon that all went out the window. This was awesome in the original sense of the word and nothing else can describe it. I wish i could have gone there for a longer period of time amnd gone rafting or hiking. Vegas looks like such a terrible place when you return!! The Grand Canyon is an absolute must if you are anyhere near it!! Pueblo People: More than 2000 Ancestral Puebloan ruins have been found at the Grand Canyon. Guano 'Mining': Bat Cave Mine was the site of significant investment to extract guano commercially in the 1950s - but small volumes and low price made the project unsuccessful. The mine is on the north side of the Colorado river and became a part of the National Park in 1974 (pre-inscription). An aerial ropeway was built to take the guano to the south rim within the Hualapai Indian Reservation at "Guano Point" (outside the NP). John D Rockefeller Jr: "In 1926 the Rockefeller Memorial underwrote the cost of the Yavapai Observation Station Museum at Grand Canyon National Park"
488 Community Members have visited.